The Lions have endured a bruising Asian Cup qualifying campaign, and have little to show for their efforts. Rooted to the bottom of Group E with just two points, V. Sundram Moorthy's charges are four points behind third-placed Chinese Taipei and five points adrift of both Turkmenistan and Bahrain. With just two matches left, nothing less than a win against Bahrain next Tuesday at the National Stadium will be enough to keep their fading hopes alive. They will line up against Lebanon tomorrow, in a final warm-up fixture before the do-or-die match. But the Lions insist that there is much more than just their flailing Asian Cup dream to play for. 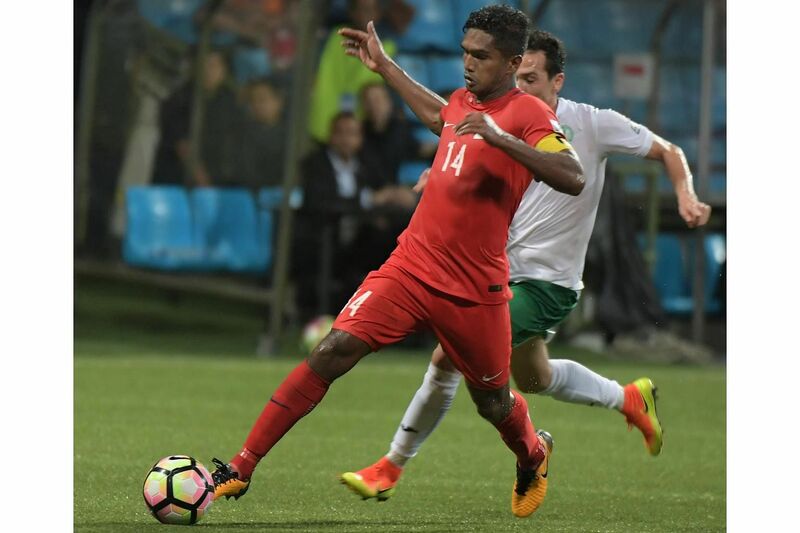 "These are home games - important because it's about us, as a team, proving ourselves to Singapore," said Lions captain Hariss Harun. "Things have been going against us for a long time now and we know that results haven't been good, but in recent games, there have been things to be optimistic about, in the performances that we've put in. "We have to be patient and keep working hard for the flag on our chests. And support from Singaporeans will do us a world of good because what we do is for them." It was a sentiment echoed by goalkeeper Hassan Sunny. "Everyone knows that we've had a bad year, everyone involved in the team knows it too, but we really want to end the year on a good note. We really need a win," said the 33-year-old. But this does not mean that they are giving up on the chance of qualifying for the 2019 Asian Cup Finals in the United Arab Emirates. "It was really demoralising to lose in the last minute in that last game, but it is clear that it has not been a good campaign so far for us even when we were playing at home," said Hariss, referring to Singapore's 2-1 defeat by Turkmenistan, in their last qualifier in Ashgabat on Oct 10. "But we still have a mathematical possibility of qualifying and as long as there's a chance, no matter how small, we will give it everything we've got. We will go all out." To qualify, Singapore will have to beat Bahrain next week and Chinese Taipei in their final group fixture on March 27, while keeping their fingers crossed that results elsewhere go their way. "We will go out there and do a job, no matter what circumstances we are facing, that's what professionals do," said Hassan. "Some of our boys have been showing some good form in the league, and I hope that they can bring that form to the international level too." Hariss too retained some optimism, drawing from a famous win in 2009 that saw the Lions break a three decade-long jinx. An Aleksandar Duric goal saw Singapore beat Thailand 1-0 in an Asian Cup qualifier in Bangkok - ending a 34-year winless run on Thai soil in November that year. Singapore eventually failed to qualify, but Hariss remembered how no one gave the Lions a chance then. He turned 19 a day after that famous fixture, but put in a Man-of the-Match performance to stifle Thai midfielders. "Bahrain are a big team that will be difficult to beat, but that was what people said about Thailand (in 2009). We made things happen then, and it will be the same now, even in the Lebanon friendly - we will keep fighting," said the 26-year-old. "And it will really be a big boost for us, if Singaporeans came to the game. After all, we always play for them, and for the country."